OnePlus is joining the Diwali bandwagon, and is conducting its own festive sale. The Chinese company is hosting a Re.1 Diwali Dash sale from October 24 to October 26, where it will give registered users a chance to purchase the OnePlus 3 Soft Gold variant, OnePlus accessories, and more via the company's online store at just Re. 1. The flash sales will be conducted at 4pm, 6pm, and 8pm IST on all three days. OnePlus will offer a mystery box to selected registered users, picked via a lucky draw. The user must then finish checkout within three hours to open the mystery box, and find out what's inside it. This oneplus 1 rs flash sale Known as Diwali Dash Sale will be Live On just a week before Diwali fastival, and this sale will run three days From 24Th to 26Th. OnePlus Diwali Dash sale Will be Live On OnePlus’s Newly launched E-commerce Portal Oneplusstore.in in above Given Dates. 1. The Diwali Dash Sale takes place at 12PM, 4PM and 8PM (IST) each day during Oct 24-26. 2. To participate in the Diwali Dash Sale, complete the Entry Challenge beforehand. 3. At the beginning of each session, a batch of ₹ 1 Mystery Boxes are released through a lucky draw. The session ends when all Boxes are exhausted. 4. You may keep drawing until you draw a Box, or until all Boxes are taken. There is a brief cool-down period after each draw. 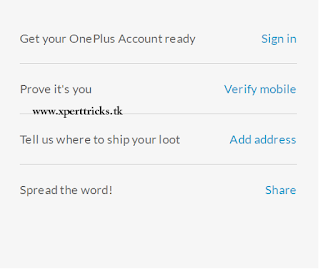 Each OnePlus Account is eligible to receive a maximum of one Box only. 5. Contents of the Box are revealed once you complete your payment of ₹ 1. Unpaid for Boxes expire after three hours. 1. Your chances of drawing a Box depends on your Dash Level. 2. Level up by registering your OnePlus devices, successfully inviting friends to sign up, or purchasing from the OnePlus Store (India). 3. Entry Challenge, Dash Level and payment statuses may take up to 5 minutes to be updated – try refreshing your browser at timely intervals. 4. Possible contents of the Box depend on event participation levels. Share the event page on social media to expand the prize pool! • As sale begins it will add the product to cart. After Completing the Above steps You are successfully Registered for The flash Sale. Flash Sale Will Start On 24th Oct 2016 . Wait for the day and Grab your Deal. Most Possible i'll be adding the autobuy trick, So Stay tuned.